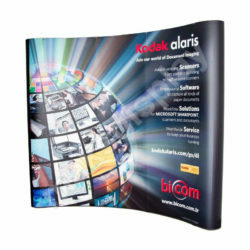 These high-quality pop up displays can help you make a big impression at a trade show, exhibition or other promotional marketing event. Classic pop up stands rely on a portable and easily-assembled pop up frame onto which the bespoke printed graphics are attached. Pop up stand trade show stands, also known as pop up display backwalls or pop up backdrops are the perfect piece of exhibition equipment to promote your business. 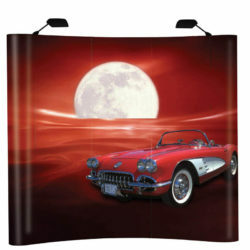 They showcase graphics on a large-scale and provide a picturesque backdrop in which to engage people with your brand. Pop up stand trade show stands, fantastic for anyone looking to boost their marketing reach. Displays Market offer only the the highest-quality products to help you achieve this, printed using top-end HD printers and on durable print materials.